You’ve got to hand it to S4 Capital chief Martin Sorrell: the guy is a PR genius. How else can one explain the amount of ink spilled over S4’s deal to acquire obscure ad tech firm Mighty Hive of San Francisco for $150M? It as if the media wait with bated breath for the next move of the ousted 73-year-old WPP chief. Will he gain a measure of revenge from WPP? Stay tuned. One hundred fifty million dollars is certainly nothing to sneeze at. But it’s not exactly a princely sum for a guy like Sir Martin, who shelled out $566M way back in 1987 in his then-unheard-of hostile takeover of venerable J. Walter Thompson. 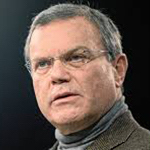 Sorrell was the outsider, a 42-year-old British swashbuckler invading clubby Madison Ave, when he shook the ad business to its core with the acquisition of JWT. That audacious acquisition set the stage for deals for Ogilvy & Mather, Grey Advertising and Young & Rubicam. Combining Mighty Hive with S4’s Media Monks just isn’t in the same league. The pair combines for 2017 pro-forma revenues of $98M and a $10M after-tax loss. The combo will have 1,100 employees, though S4’s prospectus for Mighty Hive mentions that synergies (job cuts?) are forthcoming. WPP employed more than 200K, though CEO Mark Read, who (unfortunately for him) assumed the helm during the era of disruption, is in the midst of tearing down some of the house that Sorrell built. 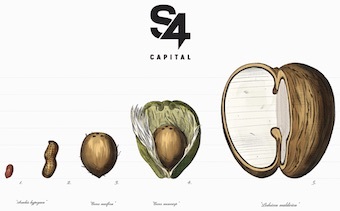 The S4 "peanut" morphs into "a coconut." JWT, which put Sorrell on the map, is among recent casualties as it gets merged with Wunderman to form Wunderman Thompson. Despite S4’s modest size, The Guardian plays it up big. It reported that S4 now has the capacity to offer a full range of digital marketing services. To drive home that point, he includes a color illustration of the transformation of a peanut into a coconut on the cover of the dense 197-page prospectus for Mighty Hive. That’s cute, but Sorrell needs a couple of watermelon deals before he has WPP fretting about a competitive threat posed by S4. Give the guy PR points for timing. The Mighty Hive announcement came a week before Read unveils his long-term strategy for WPP during an Investor Day set for Dec. 11. The specter of Sorrell will hover over that session.